Almost all the information on this website is extracted verbatim from "Joseph Hart and His Descendants," a genealogical record compiled by Rev. Charles Coffin Hart, published in 1901, and permanently on file at the Library of Congress in Washington, D.C. (LOC catalogue number CS 71 H326 1901). The book is a history of a family descended from a man known only as "Mr. Hart," who emigrated to the United States around 1735 in search of religious freedom. Mr. Hart's grandson Joseph, the primary subject of the book, served in the Army of the Revolution and was wounded in battle near Guilford Courthouse, South Carolina in 1777. After the war he moved from Loudon County, Virginia to Greene County, Virginia, and then to Maryville, Tennessee, seeking to live in an area where slavery was not tolerated. Joseph Hart believed that human slavery was "a wrong to his fellow-man, and therefore a sin against God." When slave owners entered East Tennessee, Joseph and his family left Maryville and moved to the wilderness around Columbus, Indiana. The Harts were devout Presbyterians, and Joseph and a number of his descendants served as Presbyterian ministers. Rev. C. C. Hart's book is a tribute to a loving family in which Christian faith never wavered through the most challenging times. The book is also a personal history of some of the early settlers of the South and Midwest. I visited the Library of Congress on February 24, 1996, specifically to find this book. I was somewhat familiar with the book, because at one time (and perhaps still) a copy of it was in the possession of my family. At the time of the death of my paternal grandmother, Savannah Ora (Hill) Anderson in 1959, I learned about the existence of a so-called "Anderson family history," which, it turns out, the book really is not. It's a Hart family history, and my great grandfather James Anderson married into that family rather late. But he and my grandfather Frank Eagleton Anderson are mentioned in the book. I examined the book for the first time in the early 1970's. It had been stored in my uncle Frank Hill Anderson's attic since my grandmother's death. I was so fascinated by the tales in the book that I made some notes detailing my genealogy, and I kept them for years in my wallet until the paper they were written on virtually disintegrated. I remember returning the book to my Uncle Hill after I made the notes, and what happened to the book after it was in my possession is unclear to me. Maybe another cousin borrowed it -- I don't know. I am confident, however, that our Uncle Sam will not misplace his copy. If you want to read the book in its original form, go to Washington and look it up. Believe me, you'll enjoy your visit to the Library of Congress. The book is stored in the Library's Jefferson Building, one of the most magnificent edifices in the world. The book's a handsome old volume, cloth-bound in two-tone brown with gold lettering on the cover. Inside the front cover is the photograph of Rev. 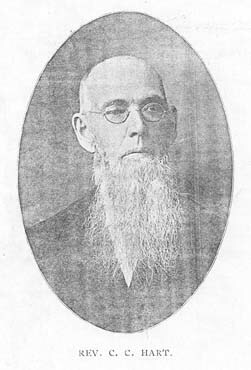 C. C. Hart shown above, in which he appears for all the world to be the stern Presbyterian preacher that he must have been. The book is holding up well; only a few pages are crumbling. The book cannot be removed from the Library of Congress, for which I am thankful. I was permitted to make a Xerox copy, though, and I have scanned that copy to produce this website. I hope you enjoy reading it at least half as much as I've enjoyed creating it.